So what does ActiveHybrid mean? BMW has given this term to a number of their cars, and it’s to do with the latest technology BMW has to make their cars perform as efficiently as possible. Hybrid technology uses the power of electricity to move cars, as well as using the power from the petrol-fed combustion engine. Depending on the driving requirements and demands, the electric motor supplies enough power to drive even long distances on electricity alone. The kinetic energy that is generated under normal driving conditions is saved by the lithium-ion high-performance battery – which also supplies power to the electric engine, as-and-when it’s needed. For extra power when overtaking, the combined power of the combustion engine and the electric motor give even greater muscle. Cleverly, BMW uses data from the navigation system on the distance and type of surface as well as the current position of the vehicle to select the most efficient driving mode. When the car is in ECO PRO Mode, the ActiveHybrid3 runs solely on electricity – as far as this is possible. The experience of gliding along with no combustion engine running at speeds up to 160 km/h is a special and hushed experience. ActiveHybrid technology in the BMW ActiveHybrid 3 cars also uses the ever popular Start/Stop technology, where the engine will switch off when the car is halted. As soon as power is needed, the engine comes instantly to life when the accelerator is pressed down. 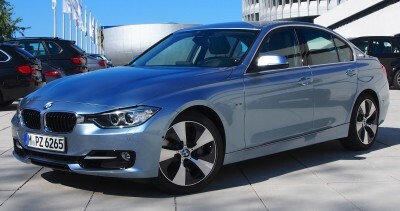 Performance in the new BMW ActiveHybrid 3 is superb and fun. It is actually quicker than the petrol-only powered equivalent BMW 335i – which cases quite a stir. With added power from the electric motor, the 3.0-litre, six-cylinder packs a 250 kW punch that is capable of making you sink back into the driver’s sport leather seat under full acceleration. Equally amazing, the BMW ActiveHybrid 3 can run the 0-100 km/h sprint in just 5.3 seconds and return a combined fuel economy figure of around 6 litres/100 km. There is always plenty of power on reserve. This is one car that you can easily pull out and pass slower vehicles on steeper inclines, as the 450 Nm of torque feels ever there in reserve. A smooth experience that’s as cool and refreshing as chardonnay, the eight speed automatic gearbox knows exactly where it should be regardless of your demands on the horses under the bonnet – while only giving a slight hint of the gear changes. So smooth is the new 3 Series Sedan’s design that you don’t detect that the inside of the car has grown in space. The back seat occupants do enjoy a commendable growth in legroom over the outgoing model. A strong look of dynamic and elegant design carries over into the way the car handles and performs on the road. Shedding some 40 kg, the overall weight of the car is again lowered over its predecessor. 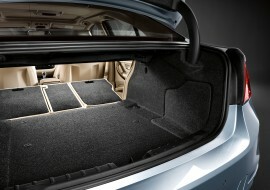 A nice feature for the BMW ActiveHybrid 3 Sedan is in the way all of the rear seat backs fold forward to create a massive load carrying area. A nice feature for the BMW ActiveHybrid 3 Sedan is in the way all of the rear seat backs fold forward to create a massive load carrying area. BMW offers the ActiveHybrid 3 with three or four trim and equipment variants: The Sport Line, Luxury Line and Modern Line. Very fine materials and build quality are used in each car, giving an attractive finish. Go for the Luxury Line model, and the cabin space is a very high-end experience with Dakota leather with exclusive stitching available in Saddle brown with extended trim colours: Veneto Beige or Black. M Sport touches add things like spunky 19-inch rims, an aerodynamics package and Dakota leather seat trim in coral black with red highlighting. You can even add an M suspension setup and M sport brakes to your already swift ActiveHybrid 3 sedan. For any more information on the new BMW ActiveHybrid 3 or, for that matter, any other new car, contact one of our friendly consultants on 1300 303 181. If you’d like some fleet discount pricing (yes even for private buyers! ), we can submit vehicle quote requests out to our national network of BMW dealers and come back with pricing within 24 hours. Private Fleet – car buying made easy!